January 28, 2019 Buntita Bamrungchaowkasem, M.D. Allergy screening test is a part of the diagnosis and treatment process available for those who suffer from allergies. It can also help identify the exact substance which is causing the patient’s allergies. Allergy screening may be carried out either by a Skin Prick Test or by Blood Tests for specific IgE, both of which can help identify allergies to various substances, including house dust mite, animal dander, cockroaches, pollen, mold, food or medication. Skin prick tests are inexpensive, accurate, and a quick way to screen for allergies. Being aware of what we are allergic to can help us avoid those substances, thereby helping alleviate the symptoms of allergies faster than through medicated treatment alone. What is the difference between Skin Prick Test and Blood Sample Test? There has been a large amount of researches looking into comparisons between Skin Prick Test and Blood Sample Test and it has been found that the results of both are extremely similar, with little to choose between them. Nevertheless, each method has its own benefits and disadvantages. So patients should give careful consideration to both before making a decision. Skin Prick Test: This procedure is simple and cheaper to carry out than a blood sample test. In preparation for the screening, patients must abstain from any antihistamine and sleeping medication for a period of 7 days prior to the day of screening in order to ensure the highest levels of accuracy. However, it is not recommended for patients suffering from severe eczema, pregnant women or in small babies. Blood test for Specific IgE: This procedurecan be performed on any patient, including those who are currently taking antihistamine medication. The simple process consists of taking 3-5 ml. of blood sample. The disadvantage is the result can be obtained in 2-3 days, and when compared with a skin prick test, this assessment is more expensive depending on the amount of the allergens. Allergic screening test can inform doctors about exactly which substances the patient is allergic to, helping them provide a more accurate diagnosis than when only performing a basic health checkup or analysis of the patient’s medical history. When we become aware of what we are allergic to, we can avoid those substances altogether, thereby helping alleviate the symptoms of allergies faster than through medicated treatment alone. However, in some cases, when an allergy has been identified, doctors may consider the treatment in the form of Allergen Immunotherapy. When should a patient get the Skin Prick Test? Cleaning forearm (or upper back) with alcohol sheet. Dropping fluid containing the various allergens onto the area of inspection. Using a sterile needle to gently prick the surface of the skin so as not to produce any bleeding. Waiting 15-20 minutes for the results. If patients are allergic to any of the substances, they will show red and itchy bump around the area of skin where that particular allergen was placed. In preparation for the screening, patients must abstain from any antihistamine and sleep medications for a period of 7 days prior to the day of screening in order to ensure the highest levels of accuracy. 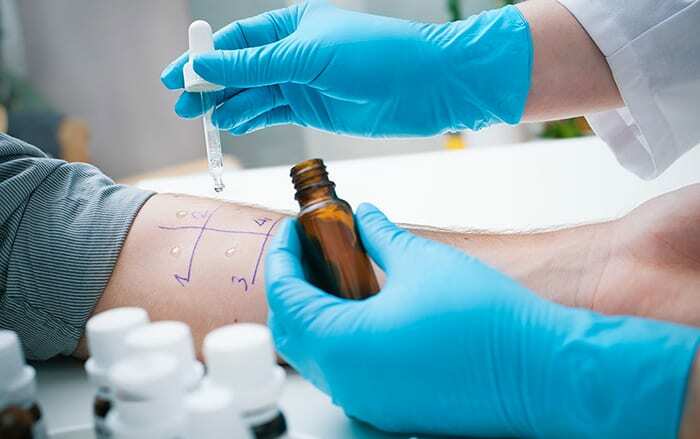 Although skin testing is one of the simplest and safest forms of allergy screening, there is still a risk of a severe allergic reaction occurring. However, the chance of such an occurrence is one in a million. Nonetheless, it is advised that patients undergo this screening in an accredited hospital which has specialist doctors available to carry out the assessment, explain the results, and provide treatment. Skin Prick Test (Allergy Screening Tests) Allergy screening may be carried out either by a Skin Prick Test or by Blood Tests for specific IgE, both of which can help identify allergies to various substances, including house dust mite, animal dander, cockroaches, pollen, mold, food or medication.